Gary Numan, in the '80s. After a week off to deal with the deluge of news that flowed from the 2010 Winter NAMM Show, SampleRadar returns to bring you more high-quality (and royalty-free) loops, hits and multisamples. For a long time, a lot of the music produced in the '80s was held in low regard, but it seems to be an endless source of inspiration for many of today's artists. 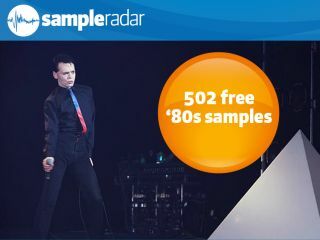 We're celebrating this new appreciation by bringing you a selection of samples that take their lead from the likes of David Bowie, Gary Numan, Michael Jackson and - gulp - Toto. The samples are split into six folders, each of which contains a construction kit of samples at a defined tempo (93, 117, 118, 120, 125 and126bpm). As well as loops, each kit also contains hits. The '80s samples are supplied in a zip file, so you'll need to extract them before you can see them. Enjoy!